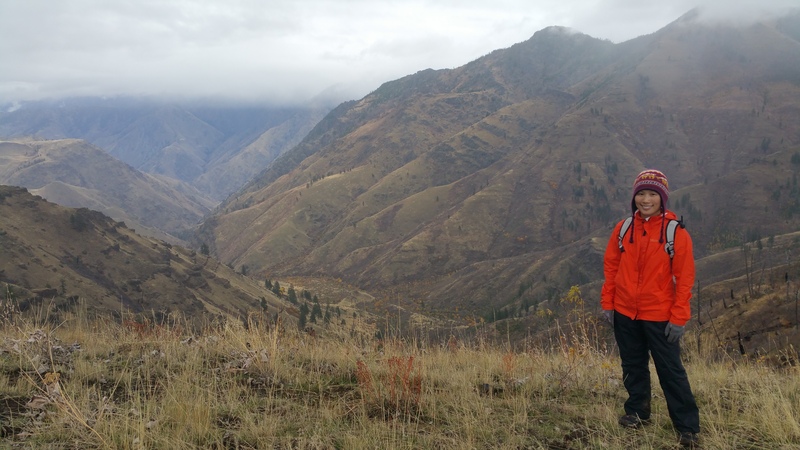 Perhaps the most remote destination in the Pacific Northwest, Hells Canyon sits along the border of Oregon and Idaho with the mighty Snake River below carving the deepest river gorge in the U.S. Even during the scorching hot peak season of summer this national recreation area seldom sees tourists due to its far location from any major city, meaning the off-season would entail pure solitude. 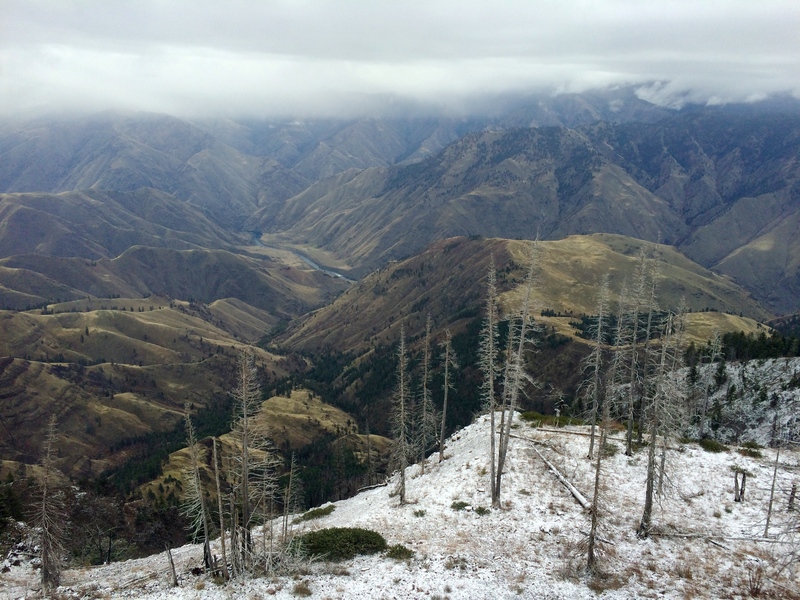 Two things I had to consider before making the trip to Hells Canyon: whether or not the roads were still open (some typically close by end of October), and if the long drive through tiny hamlets would make the trip worthwhile. In my previous post about Vancouver Island, I mentioned that road trips are sometimes about the little towns you pass through before the final destination. The side trips and hamlets we visited in remote southeast Washington and northeast Oregon turned out to be much more memorable than I expected. I doubt anyone from home (California) knows much about eastern Oregon or even Hells Canyon, and I’m not going to lie—it was so amazing that I would LOVE to return. After our trip to Canada we stopped overnight in Seattle and continued onward to east Oregon. During the drive I made a couple phone calls for more information about road closures, and we were good to go! We found a free campground (because it was the off-season) along the Yakima Canyon River at the Roza Recreation Site in Yakima, Washington. There, Chris taught me how to fish. 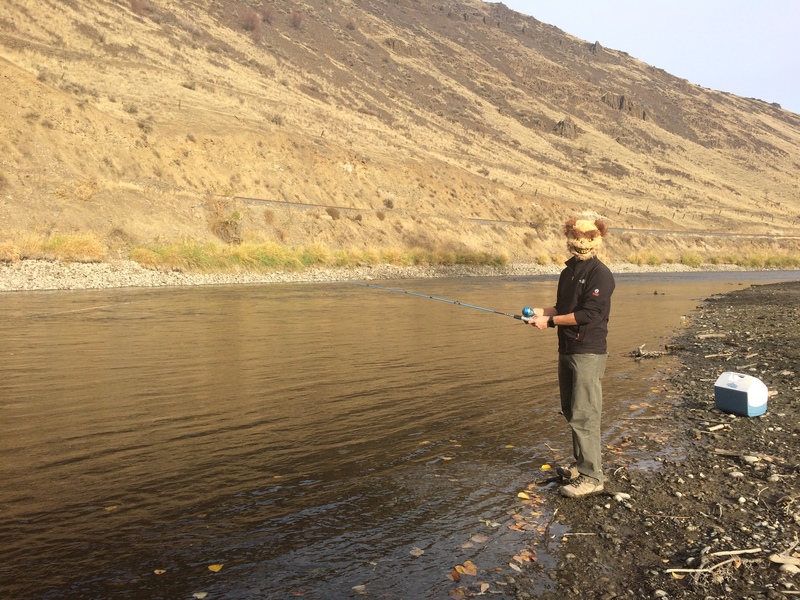 We didn’t catch anything…I actually don’t think there was anything in the river…but we still had fun fishing on Halloween. Then we drove Washington’s wine country from Yakima to Walla Walla, where rolling fields of green vineyards filled the scenery. Despite its remote location Walla Walla is surprisingly known for its culinary arts. I guess we were in wine country after all. 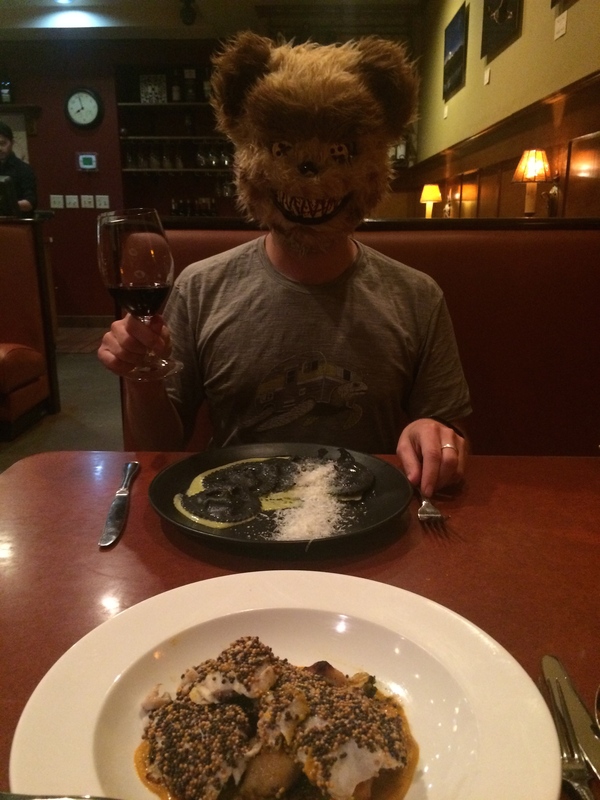 We celebrated Chris’s 37th birthday at an Italian restaurant in Walla Walla. It was Halloween so costumes were a must. From Walla Walla, Washington we crossed the nearby border into Oregon and proceeded into the boonies. No more cell coverage or data in this area. 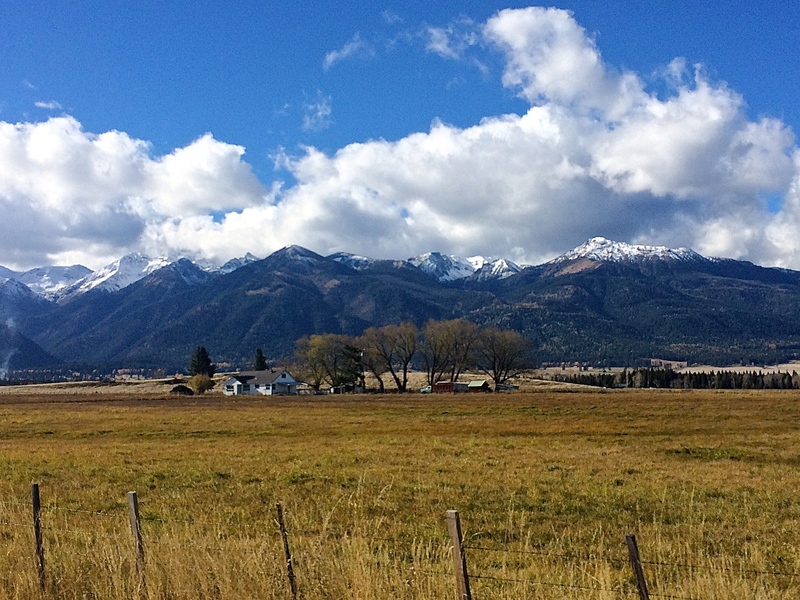 And it was beautiful…the woods, the lightly snow-topped mountains in the distance, the quaint towns we passed through. 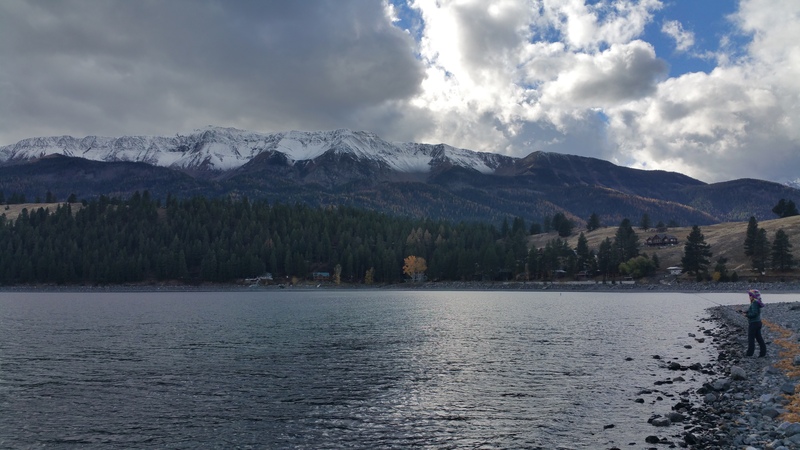 At the southern tip of the adorable town of Joseph lies the highlight of the drive—the dramatic Chief Joseph Mountain with a perimeter of snow-dusted mountains framing the glacially formed Wallowa Lake. There was absolutely no one else there. There we unsuccessfully fished again, though we did get a couple of bites on our hooks. Dammit! Despite our fishing failure we loved being there. Gazing out at Chief Joseph Mountain with the dark clouds rapidly drifting over its peak while casting and drawing in our fishing lines was surreal. Late afternoon soon came upon us and it was time to go. 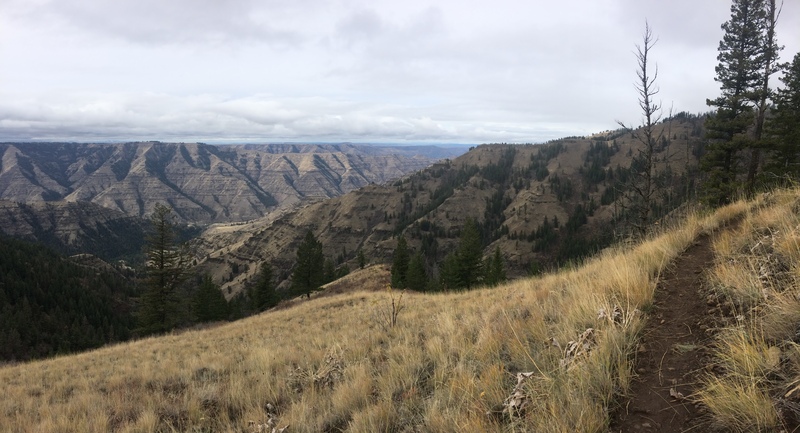 Originally we planned to drive to Lick Creek Campground, the nearest Forest Service campground to Imnaha, but still a ways from Imnaha. 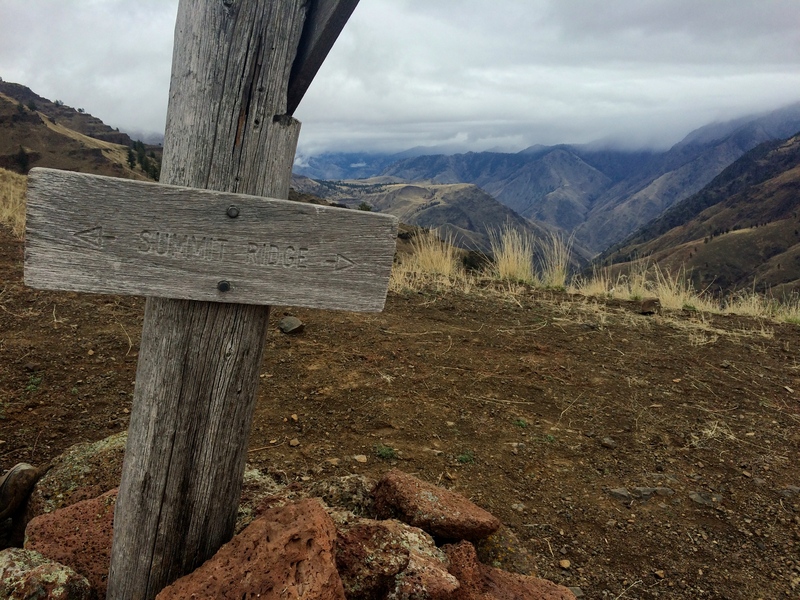 Imnaha was the final hamlet where the paved road would become a 24-mile gravel road up to Hat Point Overlook, presumably the best lookout of Hells Canyon. Normally we don’t mind towing our trailer with us, but everyone advised against towing a trailer up the steep, narrow gravel road. In my planning I had hit a roadblock—where to leave the trailer? Dropping it off at Lick Creek Campground was my safe bet. 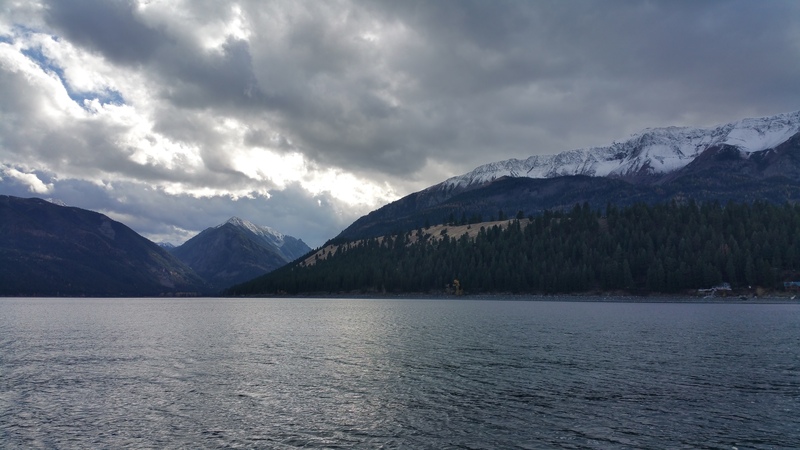 As we left Wallowa Lake we decided at the spur of the moment to not take the detour to Lick Creek Campground and instead drive all the way up to Imnaha and ask a local if we could park somewhere for the night. Worse case scenario—we drive back down to Lick Creek Campground. And everything worked out perfectly. 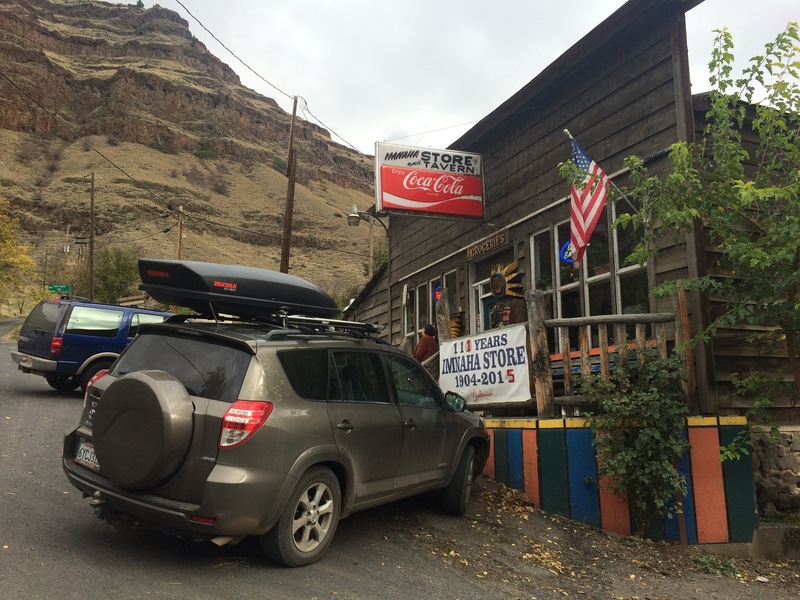 It was past sunset when we arrived to Imnaha and the only building showing any sign of life was the tavern. 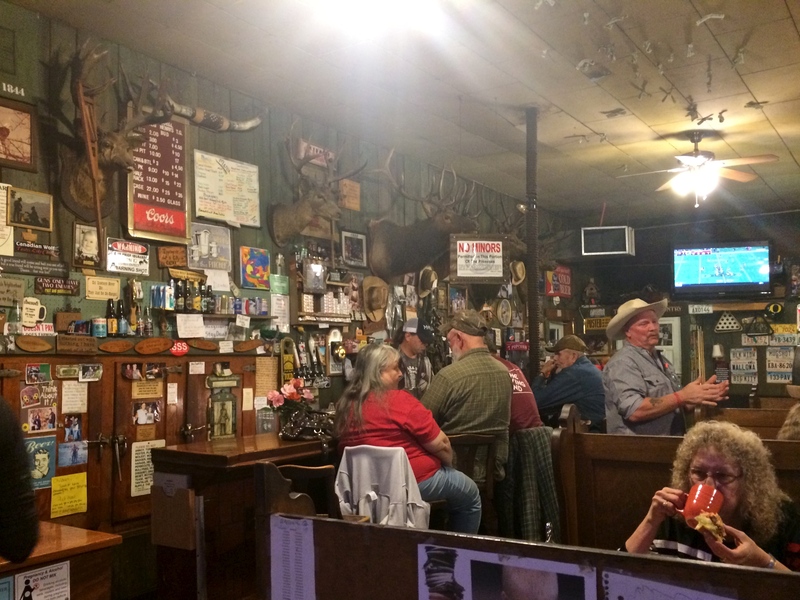 Upon entering the tavern we were immediately delighted by what we saw: cowboys, taxidermy, dollar bills tacked to the ceiling, and bright, sarcastic signs and posters covering every inch of the wall. To stumble into a tavern boasting with personality was what we least expected to say the least. We asked the man behind the bar if there was somewhere in town where we could spend the night, unhitch the trailer, and head up to Hat Point the next morning. 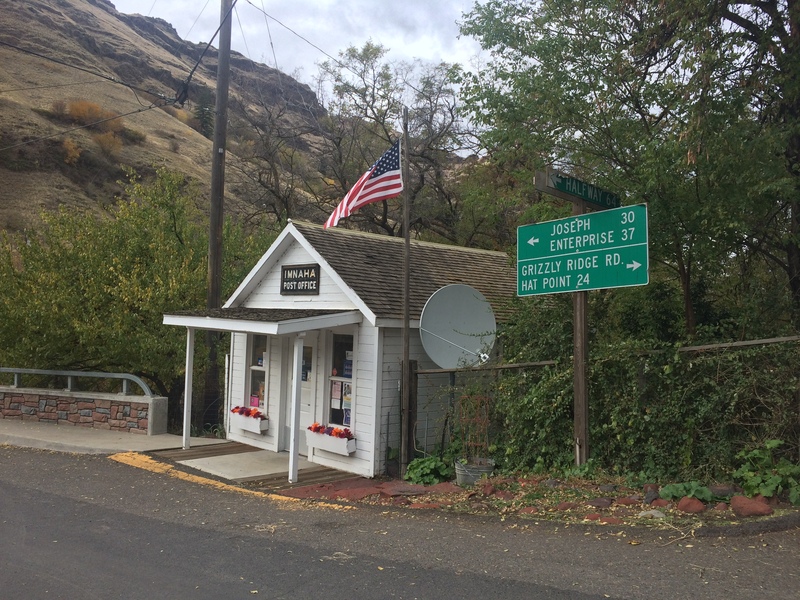 He pointed us just a ½ mile down Upper Imnaha Road along the river. The site was perfect and we settled in during the remaining minutes of daylight. Early the next morning we set out without the trailer up the gravel road to Hat Point Overlook. Despite what everyone else said, we regretted not bringing up the trailer—it really wasn’t as bad as everyone made it sound. It was smooth and without potholes, and only steep the first 5 or 6 miles. The drive was along a forested ridge with spectacular scenery all around. We even saw the Oregon Cascades Mountain Range 80+ miles away! Up and up we climbed toward the Hat Point Overlook, 6,982 ft. high. As we drew nearer flurries of snow whirled around us. At the parking lot, everything was dusted with fresh snow. We were the only people there. Since we made it this far, I wanted to hike in the area. 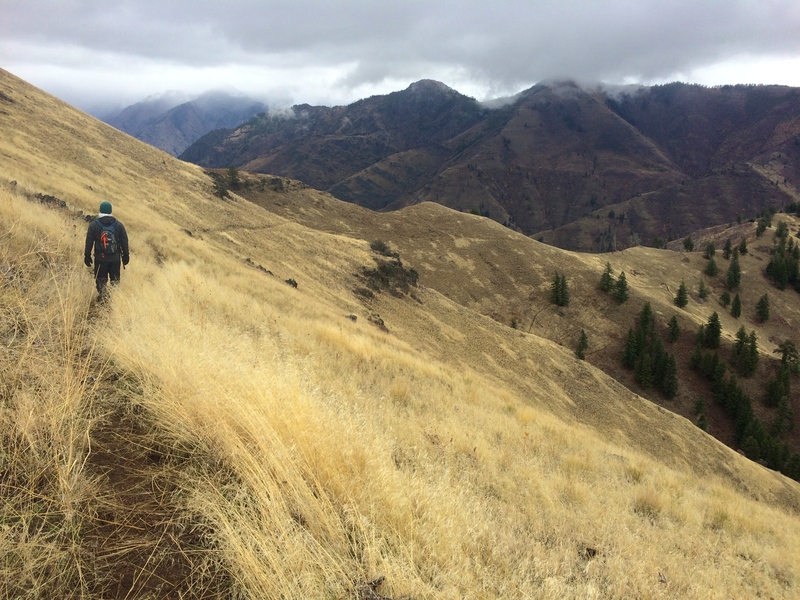 Thanks to www.lesstravelednorthwest.com, I found several hikes in the Hells Canyon area. Picking the trail was easy; finding the trailhead was a bit harder. But we found it, marked by a large rock pile, just about a ½ mile before Saddle Creek Campground. Luckily it didn’t rain or snow at all (okay, maybe a few flurries) during our hike, but we still hiked through freezing temperatures. After the hike we made our way back down to Imnaha, grabbed a hot lunch at the tavern, picked up the trailer, and headed south toward Boise, Idaho. 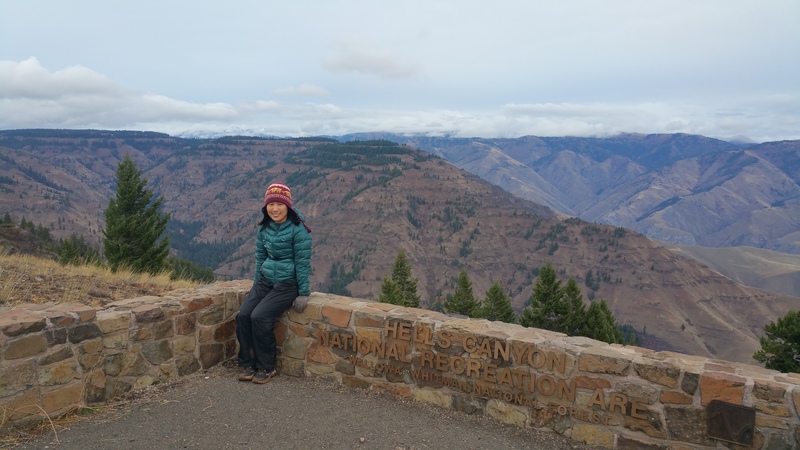 We made a quick detour to the Hells Canyon Overlook, not as spectacular as the Hat Point Overlook, but worth a stop since it is the only overlook of the canyon from a paved road. As you can see from my face, it was incredibly cold and windy. My teeth hurt for the couple seconds I smiled for this photo. Yowza. And onward we went…to the south…and to the east. Our next leg of the trip was southern Utah, a region we are quite familiar with, but a favorite region of ours that we find worth visiting again and again. But between Oregon and Utah was Idaho, which meant seeing more small towns and natural sites unbeknownst to us. As we crossed the Snake River into Idaho, the 6+ weeks of the wet Pacific Northwest finally came to a close, and the magical dry deserts soon awaited us. 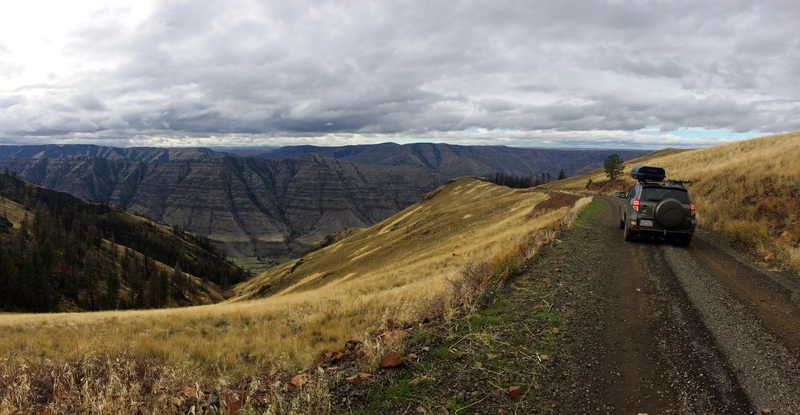 This entry was posted in Oregon and tagged hat point overlook, hells canyon, wallowa lake. Bookmark the permalink.